The classic Tony Little Cheeks? 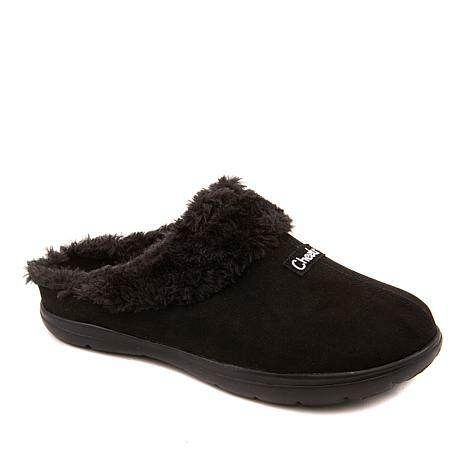 Fit Body slipper can be worn with all your favorite outfits including jeans and khakis. Microfiber lined Cheeks? insole offers arch support, breathable insole, gel on the bottom and heel strike gel cushioning. Fully flexible, fully grooved outsole moves with your feet as you walk. I love Tony's Cheek sandals and have been wearing for years, so thought I'd try these slippers. Oh how I wish I'd had these years ago too. I have arch issues and it's hard to find a comfortable house slipper. Pitched the old Birkenstocks as soon as I got these! I have quite a few Cheek footwear. The boots, to the sandals, and now these slippers. They are the most comfortable slippers I've ever owned. True to size and I've spot cleaned when I've spilt coffee on them. Love putting them on after being on my feet all day. And like with every Tony Little footwear, the quality is top notch. If you have never tried them, buy them, your feet will definitely Thank You! I have gone through sonmany crappy slippers. I seen these oh my. They are so perfect for your feet. Well worth my money. These are my new go-to shoe for around the house. They have good arch support, good traction on slippery surfaces, and the sole is sturdy enough for a walk to my rural mailbox. My usual house shoe in warm weather has been the Tony Little Cheeks flip-flops for the past 3 years, but I need something warmer for my toes when it's cold. These are perfect!